Twitter/@TODAYshowScot Peterson spoke out about President Donald Trump’s comments calling him a coward after the mass shooting at a Parkland, Florida, high school on February 14. 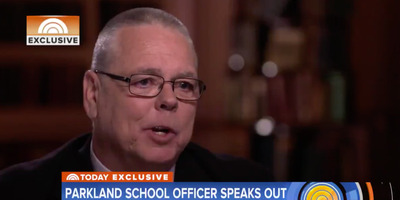 The former Florida deputy who was labelled a “coward” after the Parkland shooting broke his silence about President Donald Trump’s comments. Trump had vehemently criticised the deputy, Scot Peterson, for failing to confront the gunman who killed 17 students and staff members. Scot Peterson, the former Florida deputy who failed to confront a gunman who killed 17 people at a Parkland high school in February, spoke out on the “Today” show about how President Donald Trump labelled him a “coward” after the massacre. “The only think I can think is he went on the false narrative of Sheriff Scott Israel,” Peterson told host Savannah Guthrie, referring to the Broward County Sheriff who accused Peterson of doing “nothing” for several minutes while the gunman roamed the school. Trump harshly rebuked Peterson’s actions after an investigation found that he never confronted the shooter, despite being the only armed deputy stationed on the school’s campus. Authorities also released surveillance footage from the high school showing that Peterson remained outside the building where the shooting was occurring. Peterson broke his silence earlier this week after two interviews with the “Today” show and The Washington Post. He told both outlets that he regrets that he wasn’t able to confront the gunman, but that he didn’t know where to find him. He told Guthrie that it “hurts” that Trump had criticised him so harshly.